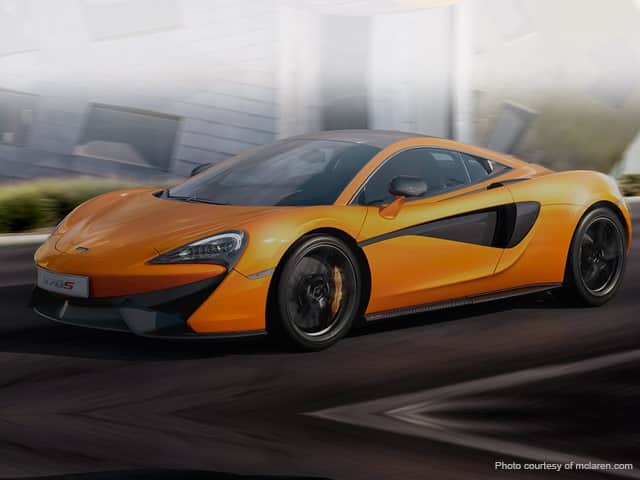 The McLaren 570S Coupe gives you the ultimate sports car experience. With its completely driver-centered and performance oriented style it feel equally at home be it on the track or out on the open road. The coupe has the lightest weight and the highest power to weight ratio in its class due to which it deliver a super car punch and a thrilling experience that many other rivals will fail to provide. Nothing prepares you for the thrill when the Coupe goes 0-124 mph in an unbelievable time of 9.5 seconds. It performance is nothing short of breathtaking due to its powerful 3.8 liter v8 that delivers 570 PS. The Coupe shares the Sport Series technology; carbon fiber. The MonoCell II placed in Coupe has a very strong chassis that weighs only 75kg but provides immense rigidity and stiffness which further translates into outstanding dynamic performance. The light weight construction of the Coupe, along with its powerful v8 engine provide the best power-to-ratio of any sports car. The Rare-bred Coupe provides an addictive driving experience that has the ultimate driver engagement. Its active dampers and anti-roll bars are paired with double wishbone suspension which makes the Coupe nimble and respond to every command of the driver. The system can be changed to Norma, Sport or Track, whatever the preference might be, on the active dynamics panel, which allows the optimum setting for any road condition. Hand-crafted in the state of the art production center of McLaren, the Coupe provides the ultimate exclusivity that make the car a masterpiece. A vast array of options are styling components are available, in different colors and leathers that give the driver the opportunity to unleash their imagination through the special operations.